Active Server Page or ASP is available to you by default in IIS7. 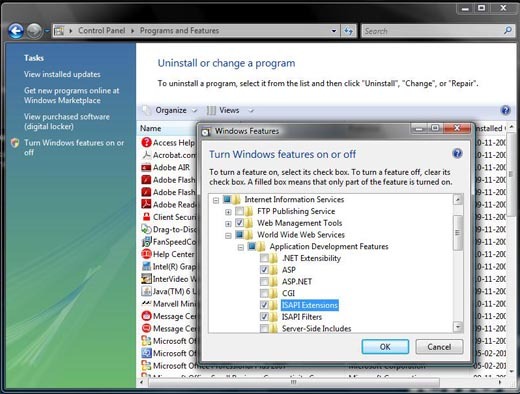 You need to install it enable it to add the asp.dll to IIS server script mapping. This is not different than any other script mapping. For better understanding you can read how PHP script is added to IIS7 ( All Screen shots are same ). We will be following the similar process here also. Inside control panel visit Programs and features. Then in left side Tasks click Turn windows features on of Off. Check the ASP button. Ensure that other two ISAPI Extensions is also enabled by checking. Now you can return to your IIS 7 or Internet Information Service Manager. Expand the links at left panel and reach the local website link. Right click and go to advance tool > you will have service manager. In this handler mapping screen , right side you will have all the action links. Click Add Script Map link. Then in the Request path add *.asp and in executable path click the browse button and point to this path. Based on the operating system the exact path may change. Now submit it and now let us test our first ASP script.